Hairou - The town located east of Kasai. Kasai - The town located west of Hairou. Kyokai - (Sea of Emptyness) The ocean that spreads between the world of the Twelve Kingdoms and Horai (Japan). Agan - A port town in Kou where the skips to En depart. It faces Seikai (Blue Sea). Hokuryou - A village where the Shusei troupe and Youko stop by on the way to Agan. Goryou - A town in koy. It is northwest of Kahoku where Rakushun's home is. Kou - The Kingomd south-east of Kei. 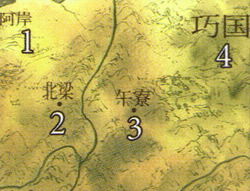 A map of the Twelve Kingdoms is located inside. It is off-limits to the public. The palace where the Shashinboku is kept. Fuukan - Shouryuu's pseudonym, which he uses when he goes to public places. 'Fuu' means wind and 'Kan' means a man. Genbu - A holy creature, which resembles a trutle and is as big as a small island. Gyoutei - God of the harvest. Hanjyuu - A half-beast, like Rakushun. A Hanjyuu can turn into a human form. Hekisouju - The crystal attached to Suiguu. It has the power to heal wounds and ease hunger. Hinman - A type of Youman. It can get inside a person and control his/her movements. Hou-Ou - Hou-Ou are a pair of birds. 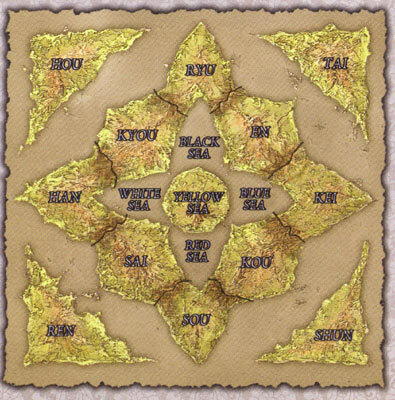 each kingdom has Hou-Ou. Hou is male, and Ou is female. An Ou can communicate with the Ou in other kingdoms. And a Hou cries when an Ou receives the news of series matter from other kingdoms. Houri - The name used in the Twelve Kingdoms for Japan. It is also referred to as Wa. Hyokia - A Speical Youman born to protect and serve a Kirin. Myokai are born before the Kirin to ensure they young creature's safety. Kaikyaku - People who have been caught in a Shoku and blown to the world of the Twelve Kingdoms. Kirin - A holy creature that shooses the rules of a kingdom. It has the body of a horse and a horn on its forehead. Kirin can chance into a human form. Koutei - A god that protects people from Youman. Saiho - The rank held by a Kirin. A Kirin is second only to the ruler. Seioubo - The superior godess who lives in the Gozan. Sekishi - Youko's nickname which means "Red Child". She's given this name because of her scarlet hair. Sennin - Sennin refers to gods that live in the mountains. However, in the wrold of Twelve Kingdoms, the king or queen can register normal people (usually officals) as Sennin. Also people can become Sennin by fasting and praying for Seioubo. Sennin can undestand and speak many different language other than the language or the Twelve Kingdoms. Sennin have eternal live, as long as they have not beheaded. Shieri - The Youma that are contracted to protect and serve a Kirin. Shinsen - A collective noun for gods and sen-nin. Shitsudou - A sickness, which a kirin suffers when the rules of a kingdom loses his reason and fails to govern properly. Shitsudou is almost incurable, (because once the ruler lose his sense, it is most unlikely that he will reform) and if a Kirin dies, the ruler will be dethroned and die eventually. Shoku - A phenomenon similar to a storm. The people of Kou believe a Shoku brings misfortune to the world. Shusei - The people who don't belong to a particular country and travel around the world. They make their living by performing plays and entertaining the willage folk. Shuukou - The Leader of a province. Taiho - The formal title used by the common people for a Kirin. Taika - People who get blown to a different world by a Shoki when they're still a Ranka. Tentei - A god, which is believe to be the creator of the world of the Tweleve Kingdoms. Tentei is also believed to grant a Ranka (a child) to a married couple. The Sword Suiguu - The national treasure of Kei Kengdom. Only the Ruler of Kei Kingdom may wield it. Yo-Ou - The postumous name of the previous ruler of Kei. Youjyuu - It's not clear what is the difference between Youjyuu and Youma. However, it is believed that people can tame a Youjyuu, but only a Kirin can tame a Youma. Zui-un - The long line of could seen inthe sky when a new ruler is crowned. It is a trail Genbu leaves when it carries the new rules and the Kirin to their Royal Palace from Mt. Hou. Bafuku - A Youma that has a body of tiger and a face of human. Chouyuu - A Youma that resembles a monkey. It has long arms. Gouyu - A Youma that resembles boar. Hankyo - One of Keiki's Shirei. He is an Isoku Youma and resembles a dog. Hyouki - One of the Keiki's Shirei. He is a Kogou Youma and resembles a leopard. Kibou - One of Rokuta's Shirei. He is Sanki Youma and can change shape. Kiki - A Youman that resembles a black wild dog. Kingen - A Youma that resembles a chicken. Its tail is shaped like a knife and is poisonous. Kitsuryou - One of Shouryuu's Kijyuu. It resembles a horse. It has red mane and golden eyes. Kochou - A Youma the resembles a crow. Kyokai - One kourins Shirei and the leader of a group of Kiki. Jyakko - A Youma that resembles a rabbit. This one is name Hiso, Keiki revealed his name while teaching Taiki to capture Shirei. Jyuusaku - One of Keiki's Shirei. He is an Youwa Youman and resembles a baboon. Jyouyou - A Youman that resembles a serpent. It lives in the sea and eats other Youma. Oumu - The parrot-like Youma that King Kou uses to communicate with others. Rikahu - Enki's Shirei. A youma that resemgles a wolf. Its tail is split in three. Saiko - A Youma that resembles a bull. Tenba - A Youma that resembes a big dog with wings, his name is Hien and belongs to General Risai. Tenken - A type of Youma. It has red body, blue wings, a yellow tail and a bleack beak. Tora & Tama - Shouryuu's Youjyuu. A Suugu Youma that resembles a tiger. Tora and Tama are very common names for cats in Japan. As many people know, The Twelve Kingdoms is based on a series of best-selling Japanese novels written by Fuyumi Ono. Before I started translating this productions, I read all seven arcs that had been publish by that time. I knew that there were a lot of specials terms and names in the world of The TK, and the last thing I wanted to do was translate those terms in such a way that might become problematic later in the series. Also I wanted to keep the same sense of a 'different world' that Japanese viewers feel while watching The TK. Even though I did have the advantage of reading the novels in advance, the first storyline of the anime series is quite different from the books. The characters of Sugimoto and Asano do not appear in the books at all and were added to the story for dramatic reasons, to help externalize many of Youko's internal conflicts. Another difference shows up in the scene where Kourin puts a spell on Keiki's horn. In the novel, it was simply described as a strange pattern. 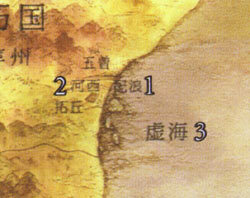 However in the animation you can clearly see the pseudo-Chinese characters. When I contacted the Japanese productions company for some clues on how to translate this, I discovered that Fuyumi Ono, the author of The TK, had specially designed the spell for the show. The An-Chin-Ki-Shin-Shu spell (calm the spirit with peace) in meant to covey the merciful nature of the Kirin even in this wicked act. Another thing I paid careful attention to was the fact that there was a lot of similar sounding names and terms in the story. That is why I chose to spell most of the names as they are written in Japanese. For example, it is "Youko" and not "Yoko", "Jyouyuu", not "Jyouyu". And to be safe, I made a list of these terms and names, and sent to them to the Japanese producers and staff of The TK for approval, along with the translations themselves. I would like to express my great appreciation to them for the time and effort they took. While there is not objectively perfect translations of something as rich and complex as the TK, I want the viewer to know that I took great care to produce something worthy of the original.